Size of group: 3 persons min., 10 max. 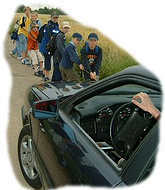 A car must be pulled along with the help of a 20-50m long rope. A driver sits in the car and operates the steering wheel and breaks. The group starts on the command signal and tries the pull the car as far as possible in 10 or 20 seconds. This station is suitable for a tarmac surface such as a path or large smooth surface (a car park). The driver must make sure that no one stumbles and falls beneath the car. For this reason the rope should be long enough or a second rope should be used so that the group has a safety distance of 5m from the car. The distance covered in 10 (20) seconds is scored and there are points awarded according to the points scale.